Happy June Everyone! I love this month, not only do we have an appearance from the sun but its also my birthday month, so I am very excited! Its also the month where it is acceptable to wear any sort of footwear, I'm taking sandals. Yes, its time to dig them out ladies & gents. 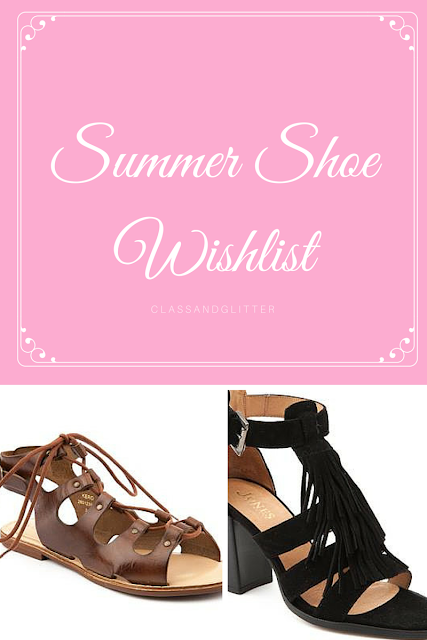 Today's post is a wishlist of some shoes that I am lusting over from Jones Bootwear, everything from sandals to boots. Jones Bootwear have a wide range of ladies shoes and ladies boots. Basically, they have anything to tame your shoe needs. I love buying new shoes, there's something about them that makes me feel really good! Shall we get onto the shoes then? Who doesn't love a pair of sandals in the summer? I for am obsessed! Jones Bootwear have a range that include flat, peep toe and even heels. These three are my current favourites, the Hadley Flat Sandals (£69) look like the perfect pair to wear during the day with something as simple as jeans. Next up we have the Jinx Heeled Sandals (£89) which I can't stop staring at. They have a beautiful fringe detail at the front and a small block heel that make them the perfect stand out pair to wear in the evening. Then we have the Kero Flat Sandals (£59) which are so roman like I love them! They have an open back and open toe which makes them different to anything I have in my possession at the moment. Great to wear in the day and evening due to the neutral colour. Now, we all know that the British weather is never reliable in the summer. It doesn't stop me from wearing sandals but it does mean that I always have to have a back up in case. Ankle boots are the perfect thing for this, they look super cute and are comfy at the same time. The Oriole Ankle Boots (£69) come in this unusual pale grey suede with gold detailing at the back, I can imagine these will go with anything due to the simple yet beautiful style of them. The next two boots are pretty similar, both come in tan and black and have this edgy fringe detail too. The Olia pair (£79) has the fringe around the top line and has a pointed shoe which is a lot comfier to wear for a long time in my opinion. Where as the Odette (£59) has the fringe at the side of the shoe with a rounded point. Either way both pairs look gorgeous and perfect to wear with anything. Summer is definitely my favourite time of year and shoes just add to the excitement. Unfortunately, my toe nails aren't quite ready for the summer season yet so I better get them in shape first! Are you a fan of sandals or ankle boots?